This year, experts have reported that tick danger is particularly scary due to last year’s warmer winter and a higher population of White-footed mice in the Northeast. More ticks equal a potential surge of tick-carrying diseases, such as Lyme Disease. 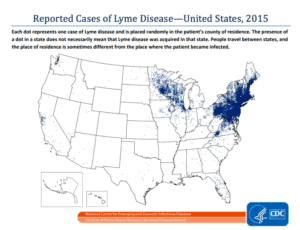 In a recent interview with NPR, an ecologist couple from New York explained that the best way to forecast Lyme disease, the most common tick-borne infection in the United States, is by the counting the white mouse population from the year before. As they reported, the number of mice in summer directly correlates to the Lyme cases the following summer. This predictor works because mice are “responsible for infecting the majority of ticks carrying Lyme in the Northeast.” Other popular predictors of annual Lyme disease risk include warm winters, wet weather, or acorn abundance. In 2016, New York’s Hudson River Valley experienced a “mouse plague” that will likely feed a bumper crop of ticks in 2017. Just one mouse can have 60 to 100 ticks feasting on its body, and white-footed mice infect up to 95 percent of ticks that feed on them with Lyme. This abundance of “mouse hotels” providing food and shelter for ticks will allow even more ticks to reproduce and create an even larger population for the following year. 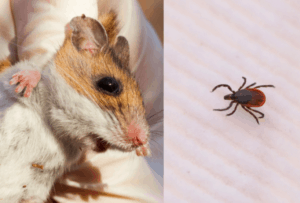 Although high mouse populations last year provide an early warning for large tick populations this year, the experts warn that they can’t pinpoint exactly which areas are at the highest risk, only that the Northeast is generally expected to have more ticks. Most infections occur through bites of tiny immature ticks, called nymphs. Unlike adult ticks, which are much larger and thus easier to find and remove before a bite can occur, the small size of the nymphs make them nearly undetectable for most people, and able to bite, feed, and transmit bacteria without being noticed by their host, possibly you! 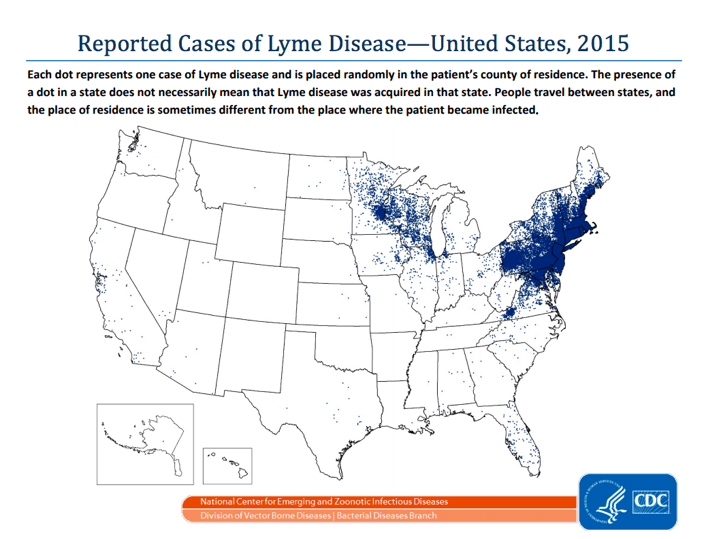 30,000 cases of Lyme disease are reported to the CDC yearly (and while Lyme is concentrated in the Northeast and upper Midwest, almost every state in the country has reported cases) although the CDC estimates that the real number is 300,000. 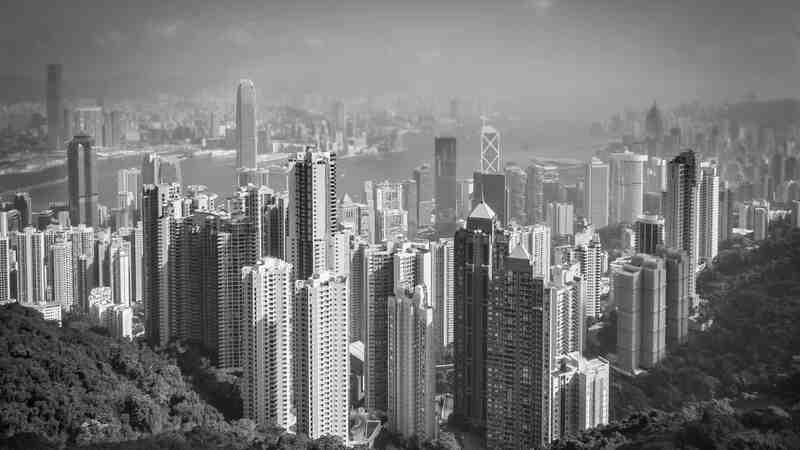 This number is derived from two separate studies the CDC conducted from data obtained from clinical labs and medical claims information from a large insurance database. At least one reason for the disparity of numbers – Lyme is notoriously challenging to diagnose. Many patients spend years suffering a confusing mix of symptoms that can appear like they belong to an entirely different disease, like in the case of singer Kris Kristofferson’s Lyme infection being misdiagnosed as Alzheimer’s. According to the CDC, rashes occur in 70 to 80 percent of infected persons, however, most rashes do not take on the well-known shape of a bull’s eye, but are rather more diffuse and easily overlooked as a sign of Lyme disease. No matter how large the tick population is compared to last year, ticks and their related diseases have been steadily increasing, so, as you enjoy your summer, be vigilant for signs of ticks and protect yourself from exposure while you’re enjoying the great outdoors.